Green-Touched Spriggan is an epic Agility creature card. It is part of the Core Set. In addition to the card's availability in the Core Set, one copy is obtainable in the Black Marsh Smugglers deck as a potential reward from Unwelcome Intrusion. 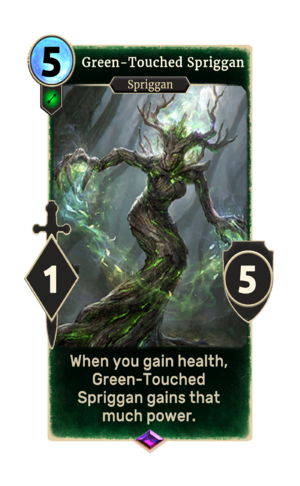 One copy is also obtainable in the Dunmer Avengers deck as a potential Reward from Unwelcome Intrusion. This card's ability applies the Nature's Wrath card effect. Spriggans first appeared in Daggerfall, and have since appeared in every mainline game in the series. This page was last modified on 7 October 2018, at 16:24.